More than 180 bands will be showcased in 18 venues in downtown Cincinnati and Over-the-Rhine. Fourteen of the 18 stages and new festival features are in OTR this year, alone. Dan McCabe, MPMF Executive Producer, says the concentration in OTR acknowledges the area’s growth, particularly Vine Street’s Gateway Quarter, Main Street’s revival with new businesses and the School for Creative and Performing Art’s new building. In past years, MidPoint showcase venues have been fairly spread out, even including clubs like the Southgate House, which isn’t even in the same state! This year, not only are all venues in Cincinnati proper, all but four are in the Over-the-Rhine neighborhood (the other four are Downtown, just a few blocks south). The Over-the-Rhine focus is a good way to spotlight the area’s ongoing revitalization and rebirth as an arts hub and entertainment destination. Containing all of the MPMF action to OTR will make showcase-hopping a little easier. While the free car shuttles of the past few years will not be returning, organizers have done a few other things to make getting around MidPoint easier. Attendees are encouraged to bring their own “shuttle,” their bikes, to zip from venue to venue. With help from the City of Cincinnati, the MPMF venue route will have multiple bike racks, offering a safe place to park your ride. Twelfth St. will be blocked off and transformed into the “MidPoint Midway,” anchored by a literal “street art” exhibition. Local community arts group ArtWorks is organizing a “box truck art” festival, a fun endeavor whereby creative citizens sign on to convert a moving truck (of varying sizes) into a living interactive experience, transforming the setting in creative ways to craft imaginative, self-contained “alternative realities” within the constraints of the vehicle. So the facts are clear, MPMF.11 is going to be bigger, better and more OTR than ever. It makes sense for MPMF to consolidate its presence in and around OTR as the neighborhood grows. • A new partnership with Procter & Gamble to celebrate the emerging intersection of modern music-making and brand marketing. • MidPoint’s Biore® Strip, three stages along Jackson Street featuring woman-centered acts sponsored by Cincinnati-based Biore® Skincare. More info here. • MidPoint Midway, a stretch of 12th Street hosting ArtWorks’ box truck festival, food, drinks, live music and a variety of street activities. More info here. • The vitaminwater room in the Hanke Building on Main Street, turning an empty club space into a hive of activity during vitaminwater’s week of “Uncapped” events leading up to MPMF.11. • VIP Sanctuary Room, offering an exclusive opportunity to relax and recharge between shows. Only 100 VIP Passes are being sold; details here. • Extensive all-ages performances at SCPA and Media Bridges featuring Kaki King, Mates of State, The Low Anthem, The Album Leaf, Toro y Moi and 20 other acts. • Opportunities for SCPA students to participate in the festival’s creative side, from interaction with performers in “master classes” to production experience and design work. More info on SCPA’s role in MidPoint here. • A new partnership with the City of Cincinnati on Bikers MidPoint, with new bike racks placed at five or more MPMF.11 venues for those wanting to go car-less during the festival, which is highly recommended. • Busken Bakery’s 10,000 Donut Deployment celebrating MidPoint’s 10th anniversary, distributing free donuts to festival attendees throughout MPMF.11. • Return of the Dewey’s Pizza Main Stage at Grammer’s to host the festival’s highest profile acts, including The Joy Formidable (Thursday), Okkervil River (Friday) and Cut Copy (Saturday). Dewey’s Pizza returns as MidPoint’s longest-running sponsor. • Return of the MidPoint Poster Expo curated by Newport-based print shop and designers Powerhouse Factories. • Return and escalation of the Tweet/Text Visualizer System by Topic Design, allowing festival-goers to see each other’s tweets and texts publicly displayed in more MidPoint venues then ever. Revisit last year’s system here. Advance sales of three-day wristbands continue online, at 19 area retail outlets and at MidPoint Indie Summer Series shows on Friday nights at Fountain Square. Three-day VIP Passes sell for $125, with three-day wristbands selling for $49 (a limited number are available for $39 at the Indie Summer Series shows through Sept. 2). All ticketing details, including online sales and a list of participating retail outlets, are here. 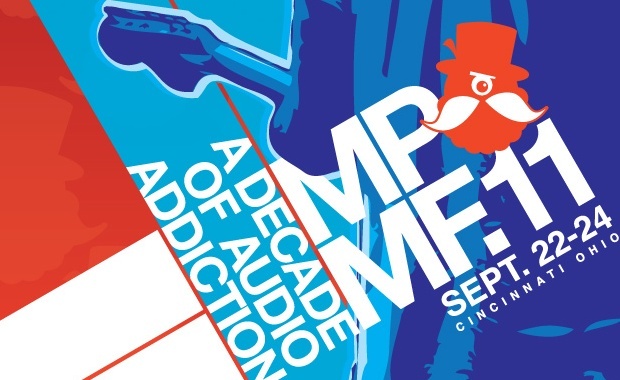 Schedule updates and further festival news will be available at MPMF.com, on Facebook and via Twitter.